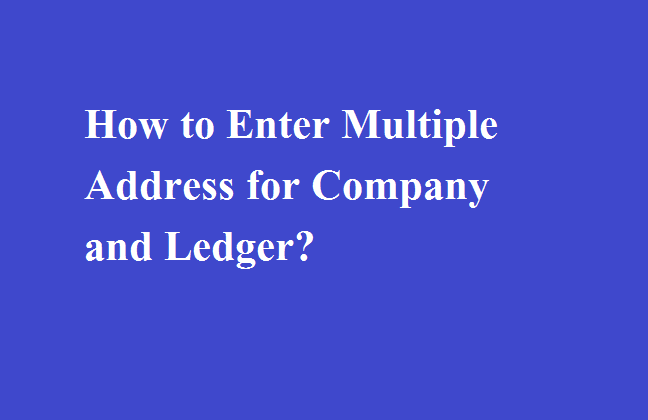 Home / TallyERP.9 Lessons / How to Enter Multiple Address for Company and Ledger? 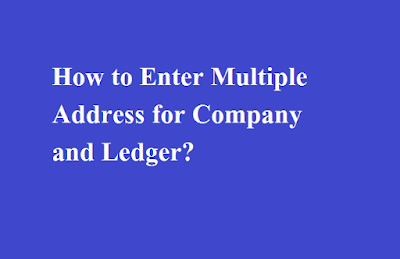 How to Enter Multiple Address for Company and Ledger? 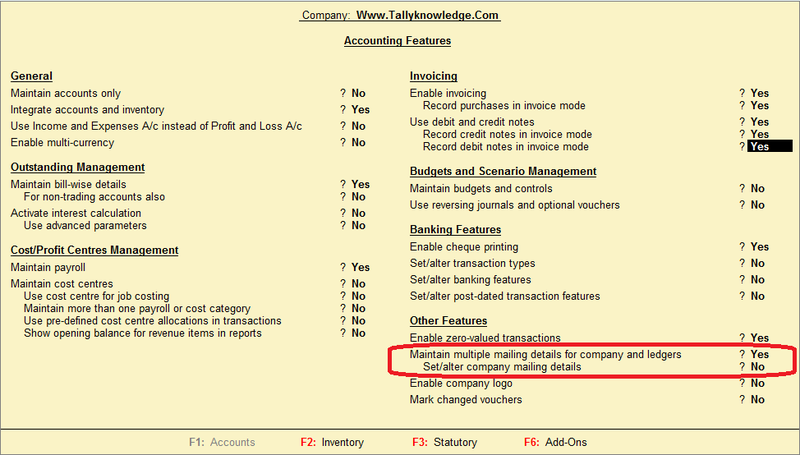 Did you know Tally provide you multiple address for company and ledger accounts as per your requirements. Do you work out of one office and have a godown located in another place altogether? Is it a problem to constantly co-ordinate with your suppliers to send the invoice to your office address, and the material directly to your godown? Or are you facing this problem where your suppliers have multiple addresses and want you to send the stock, reports, invoices etc. to different locations each time. Tally.ERP 9 provides you a simple and easy solution, by enabling you to save an unlimited number of addresses for any ledger, or even your own company, with personalised names for each. This will help in faster identification of the addresses, for example in case a company has multiple branches in the same city, then each can be identified with a unique name set by you. For example, you may want to use your Branch Office address on invoices for a particular customer, while the godown address on the Purchase Order for your supplier. Further, while printing any report, you can select the address as required; say the Head Office in some and the Registered Office in some. 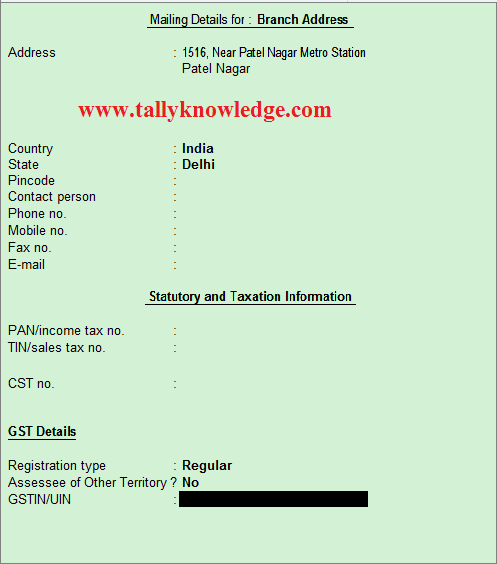 Let us see how multiple addresses can be saved in Tally.ERP 9. You come to the ‘Address Types for’ screen, which is similar to the screen which opens for saving multiple addresses for the company. Enter the name of the additional location for which you wish to save the address. Say you have entered ‘Branch Office’. You will come to the ‘Mailing Details for: Branch Office’ screen. Enter the address details. Press ‘Enter’ to return to the ‘Address Types for’ screen. Here you can save the details of all the different locations from which the ledger company operates. As shared in the beginning, one of the important benefits of this feature is that the required address can be printed on the report as per your choice. For example, if your customer has to be sent the Out-standings statement, and he has only dealt with one particular office, then you can easily modify the address on the same, to reflect the address of that location. Let us see how to select an address for printing in the Outstandings statement. 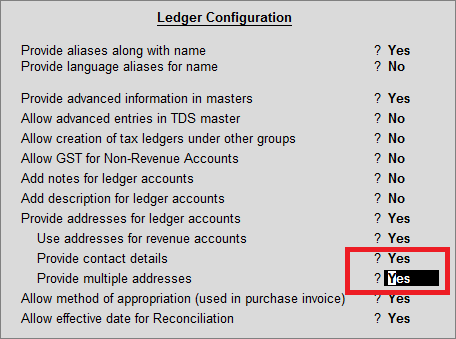 Press F12 for supplementary details to yes, also select yes to "Allow Separate Buyer and Consignee name. Select party ledger at Party A/c name field, press enter and following screen appear on your screen. Select required addres in Address Type and save the details. 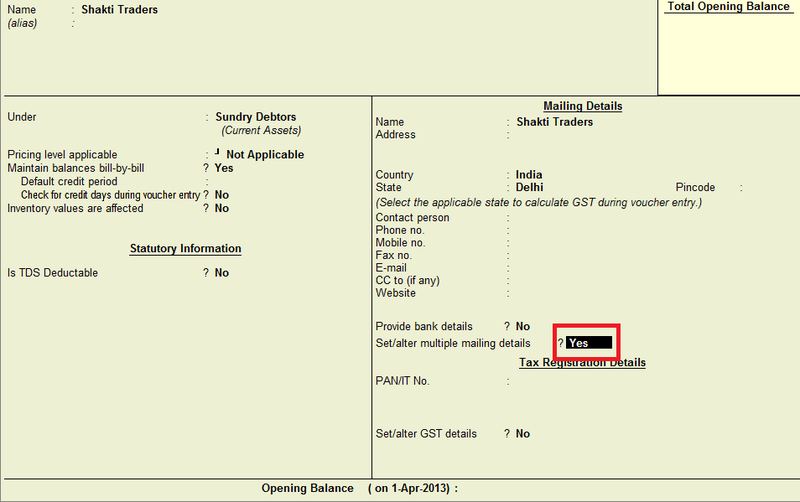 Now print the invoice and you can see there is Branch Address print in your Invoice.